Havasu is not a place for solitude. People have been living here for over a thousand years and the human presence is palpable, even downstream, past End Falls and Beaver Falls, on the little-used trail that runs down to the Colorado River. Havasu Canyon has long been inhabited by the Havasupai people, the original guardians of the Grand Canyon. The entirety of the Grand Canyon drainage was once their homelands and the tribe has fought a long and often disheartening battle with the National Park Service for the right to stay on at least a small remnant of their lands. For decades, the tribe was confined to the narrow confines of Havasu Canyon, until 1975, when 185,000 acres of traditional wintering lands on the canyon rim were returned to the tribe by Congress and President Gerald Ford. The transaction still stands as one of the largest expanses of land ever returned to a single tribe. 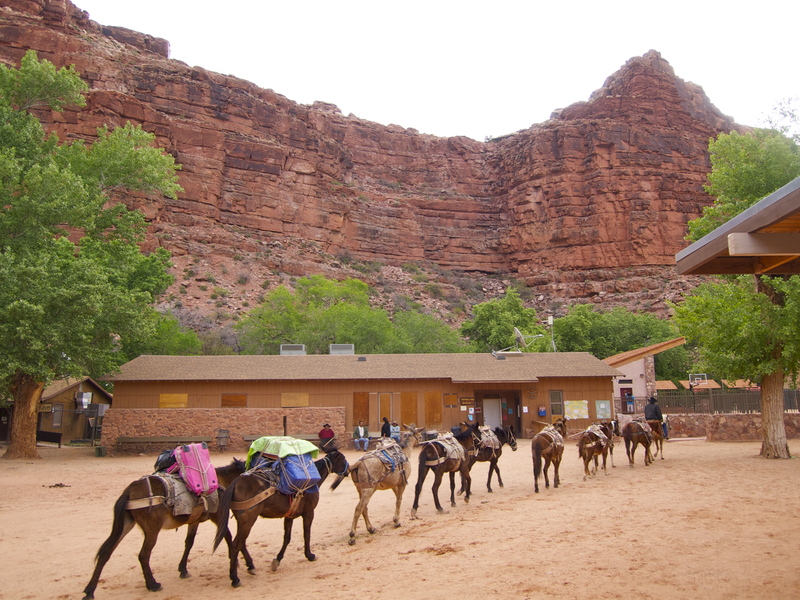 Today, the Havasupai people number around 700, most of whom live on the rim in either Peach Springs or Kingman. 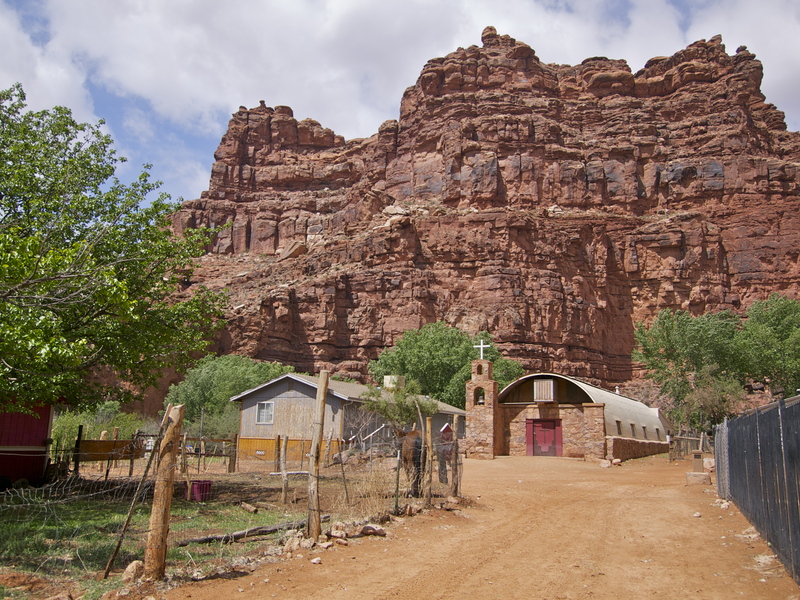 About 120 people reside in Supai, the tiny village within Havasu Canyon. Our last day in Havasu was spent sitting on a wall in Supai for five hours, watching people come and go, waiting for our chance to hitch a ride on a helicopter out of the canyon. We could have hiked out in much less time, but neither Devin nor I had ever ridden a whirlybird and we loved the idea of taking our first flight overlooking the Grand Canyon. Five hours is a lot of time to observe Supai: a tiny town with one packed-dirt main street, a café and a store. 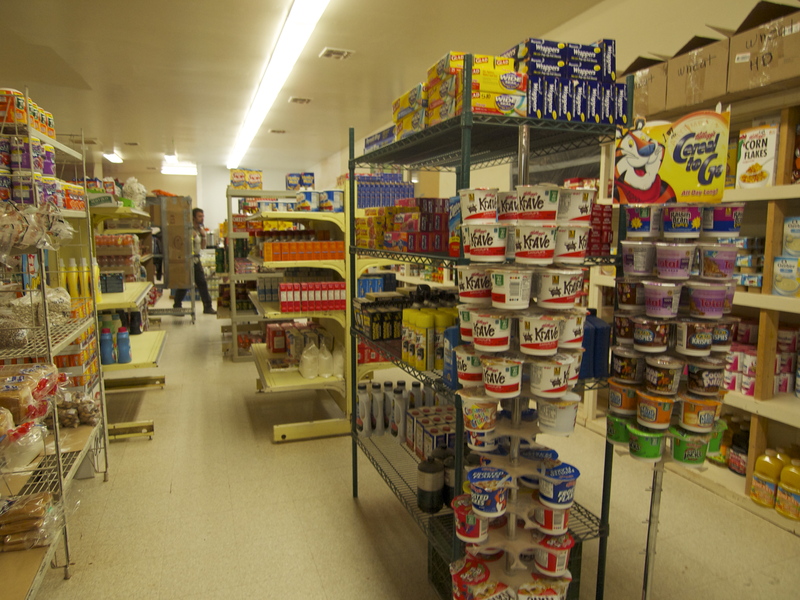 We walked up and down main street and ate in the café, paying high prices for greasy food, and perused the grocery store, which was stocked with a sparse selection of packaged, processed food at outrageous prices. Frosted Flakes were $10.99, a stack of American cheese was $7. Fresh food choices consisted of a box of bruised dollar-each bananas and a $12 pineapple. 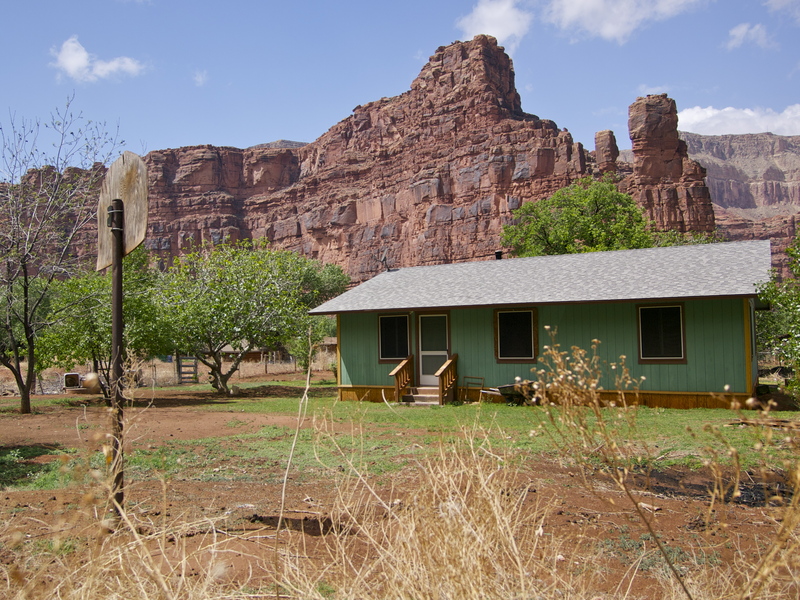 With its fertile soil and plentiful water, Supai was traditionally a summer agricultural center where the tribe grew all their own food. In late October, most people left Havasu Canyon, which receives little direct sunlight in winter and has little wood to burn for warmth, to live on the rim, where they lived almost exclusively on deer and elk meat. Knowing the Havasupai’s strict binary dietary history – vegetarian all summer, carnivorous all winter – it shouldn’t come as a surprise that they haven’t fared well on modern food. Nearly everybody we encountered in Supai was obese. Not just overweight but heart-stoppingly fat. Havasu is a world-renowned hikers’ paradise, but most of the residents would be hard-pressed to make it up to the rim or down to the river on their own power. 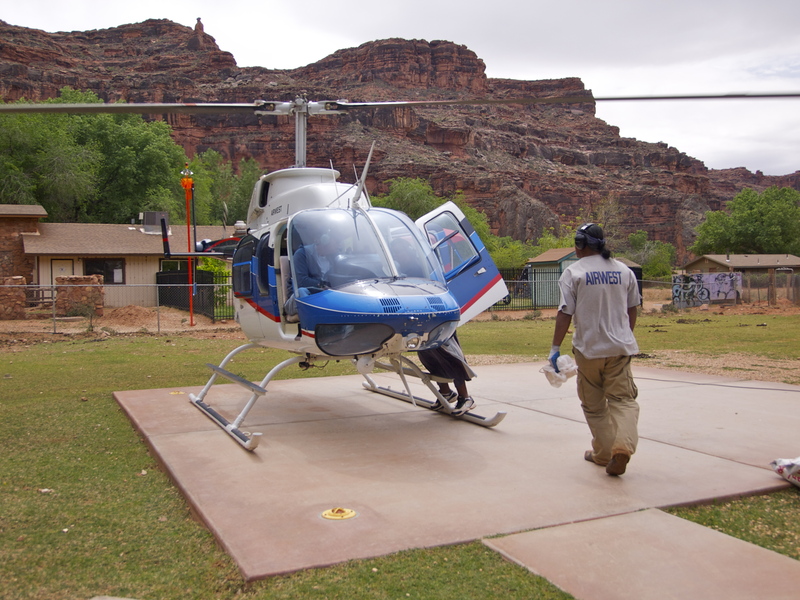 No roads run into Supai, so this is where the helicopter comes in. Two or three times a week, a six-seater helicopter makes a dozen or more flights back and forth from the rim at Hualapai Hilltop (where we parked) down to Supai, ferrying people, food, water, propane, trash and even an ATV, dangling under the bird at the end of a wire, into and out of the canyon. If you get to the landing pad early on a helicopter day and get your name on the waiting list and have $85 bucks on hand, you’ll probably get a ride out, weather permitting. Devin and I busted our still-aching legs on the climb from the campground up to Supai and were the first gringos in line. But locals get first dibs. By the time the bird finally appeared from up canyon around 10:30, it was clear we were in for a long wait. It seemed like half the town wanted out of the canyon for the weekend. One local woman told us she had to go to Kingman to file a last-minute tax return. So we had a long wait. 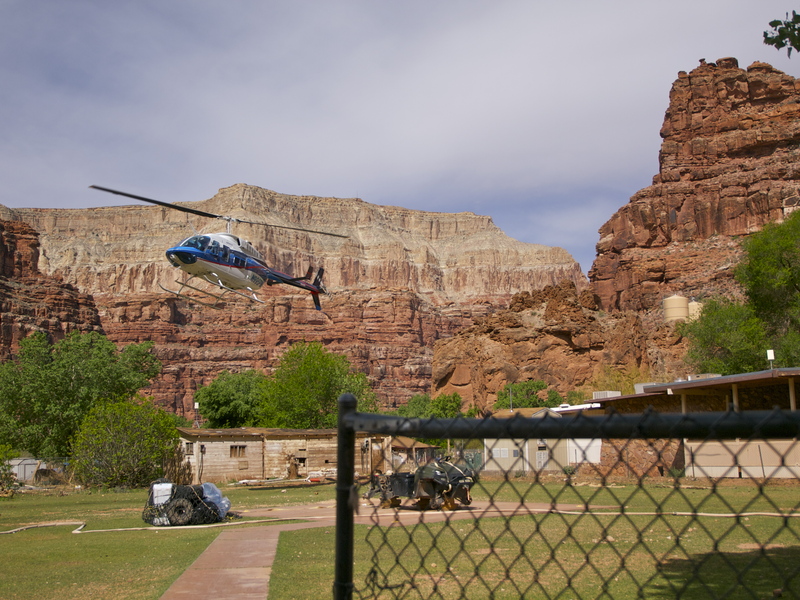 But by the time we boarded the helicopter in the afternoon, we had gleaned a much better feeling for Supai and the Havasupai people than if we had just trudged through town on our way up to the rim. I was glad for the opportunity to study the place and the people because most of what I had read about Supai was unflattering, if not downright frightening. 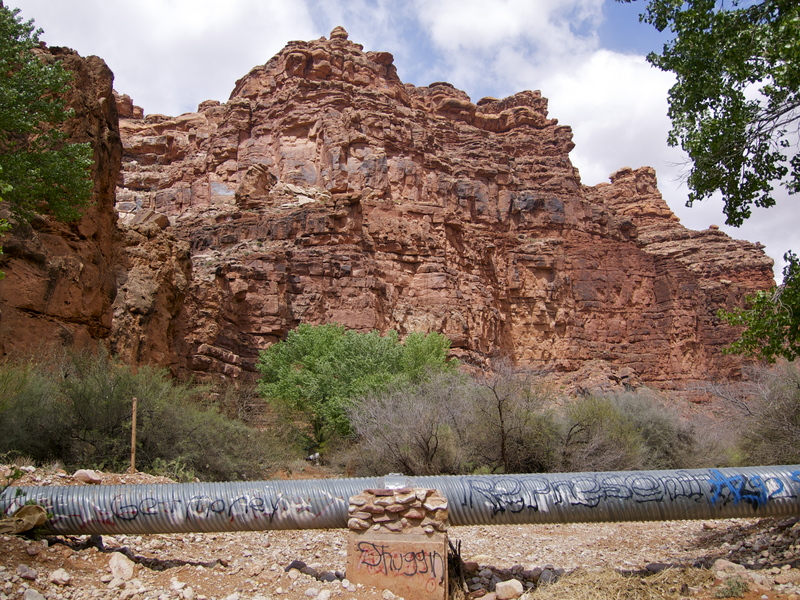 In May 2006, a Japanese woman named Tomomi Hanamure was stabbed to death by a disturbed, meth-addicted Supai teenager on the well-used path between the village and Havasu Falls. The following summer, Backpacker magazine published a dark exposé entitled “Freefall” on Havasu Canyon and the Havasupai people by Annette McGivney, who visited Havasu and Supai four times after the murder. The only graffiti I noticed in Supai: Get Money, Thuggin, Represent! McGivney isn’t the first writer to see through the beautiful veneer of Havasu, into the deeper problems of a people struggling to adapt to a new, much smaller world. When Wallace Stegner visited the canyon on horseback in the late 1940’s, he found the people friendly enough, but was appalled by the inhumane treatment and skeletal condition of their dogs. 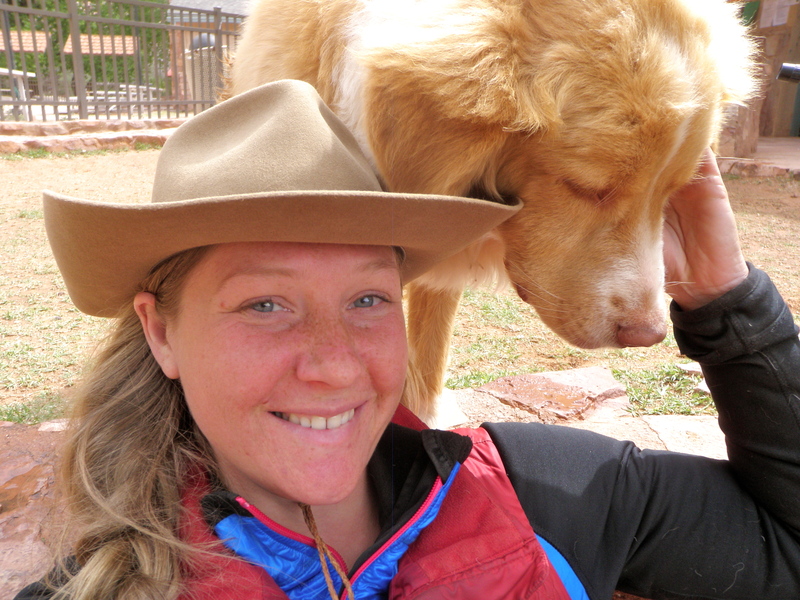 Making friends with one of the many Supai dogs. I did not have a similar experience to Stegner or McGivney. In the moments I had to myself deeper in the canyon, my senses were heightened, watching and listening, taking over due vigilance in lieu of my dogs. Indeed, Havasu has the eyes and spirits of a place with deep history, but at no time did I feel threatening by anything sinister. As a dog lover and a proud keeper of a former bag-of-bones rez dog, I was relieved to find the Supai dogs friendly and in good weight; given the steep price of a small bag of dog food in the store, I think the tribe must get a subsidy of dog food flown in to keep up appearances, lest another writer find fodder for a sequel to Stegner’s story Packhorse Paradise. The packhorses too looked decently kept. They were clearly hard-working animals, but I didn’t see any that were underweight or overburdened or lame. In fact, everything about Supai seemed much nicer and cleaner than what I had read. The houses were well built, the yards fairly neat, trash and litter was minimal, except along the trail, which can probably be blamed on the tourists, not the residents. I only saw one spate of graffiti. My friend Devin, who lives in DC was a little more appalled than me by the obvious poverty of the place, but overall, I’d call Havasu the least depressing reservation I’ve ever seen. And I’ve seen a few. I wonder whether the flash flood of August 2008, which all but leveled Supai, came as a blessing. We tend to think of floods as disasters, but they have a way of refreshing desert places. Maybe the new, improved Supai we saw has been built on the muddy, discarded ruins of McGivney’s filthy, frightening Supai. What was wonderful about the place was resurrected and what needed to be buried was left buried. Or was it? For such a small, seemingly quiet town, there was a unnervingly strong police presence: three officers in bullet proof vests, armed with guns, tasers and billy sticks, were buzzing around town, helping to organize supplies coming and going from the helicopter. Odd, I thought. 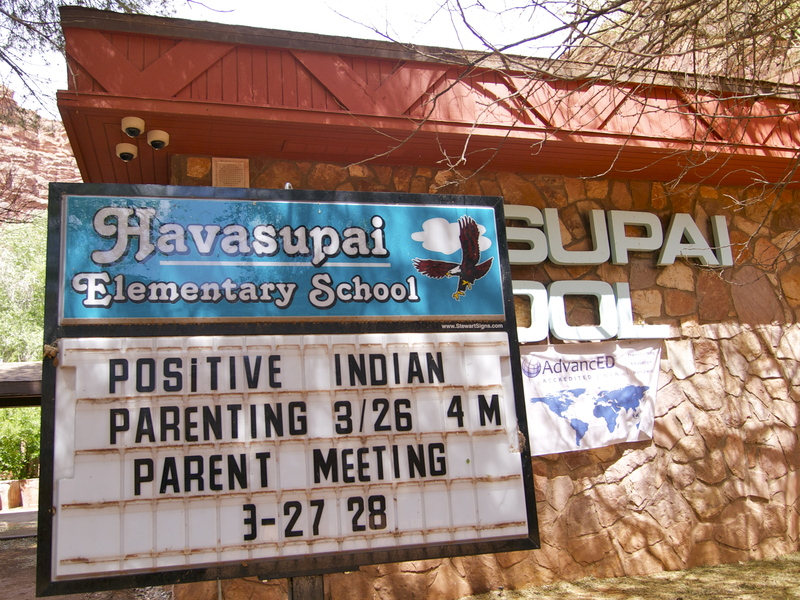 The Havasupai people were reserved, as insular people often are (I grew up in Amish Country), but pleasant; nods were exchanged with nods, every now and then, a smile for a smile. Then, finally, it was our turn! Ducking under the blades, gripping my hat in my hand, Devin and I boarded with a local man and another hiker. Rising up through that glorious green canyon, we caught one last glimpse of the blue water. Then the lushness of Havasu gave way to the stark red, brown and white landscape as we flew across twisting side canyons that had likely never known a human footprint. I pressed to the window, enthralled by the view. How often do we get to glimpse whole worlds that exist separate from our own? Literally three minutes later, we landed at Hualapai Hilltop. Amazing how a helicopter makes such short order of even the Grand Canyon! Devin and I bounded off the machine, triumphant at having pulled off the trip. Then I felt the prickle of evil eyes and turned to see three men at the edge of the helipad, standing strangely, staring at me. In the next instant, I saw why they stood so hunched: all three were in chains. Prisoners. 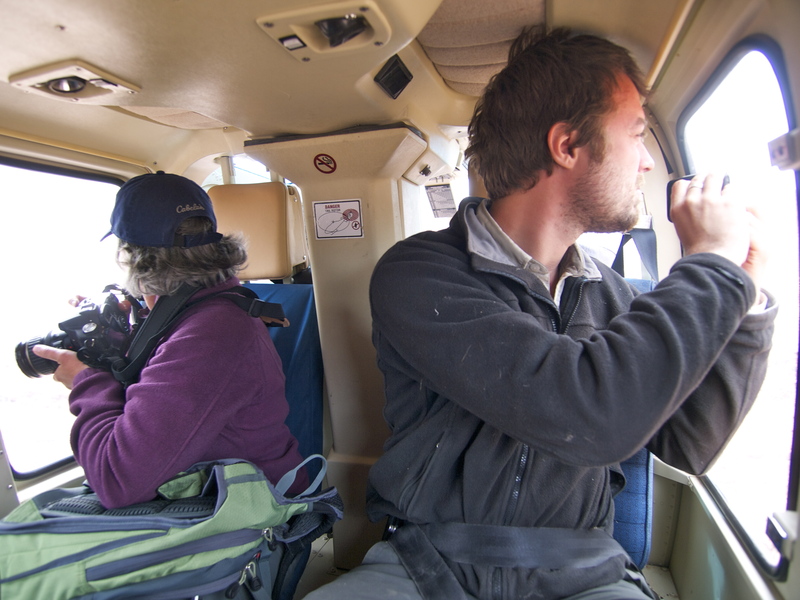 They awkwardly boarded the helicopter and the bird took off, back into the canyon. Who they were and why they were being taken down into the canyon in chains, I don’t know. But for that one instant, the last moment of my Havasu trip, I felt what Hanamure and McGivney must have felt: like prey. Read the whole Havasu series: Day 1: Havasu, Day 2: Down Havasu to the Colorado River, Day 3: Day of Rest in Havasu, Day 4: Surviving Supai. 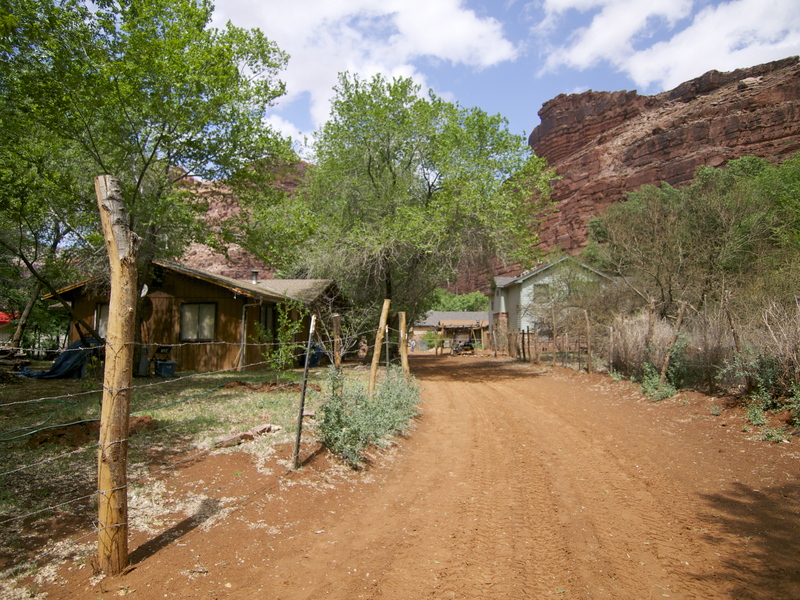 This entry was posted in Cowboys & Horses, Hiking!, Photography, Sustainable Living, Uncategorized, Vagabonding 101 and tagged Annette McGivney, Backpacker magazine, Freefall, Havasu Canyon, Havasupai, helicopter, Supai. Bookmark the permalink. 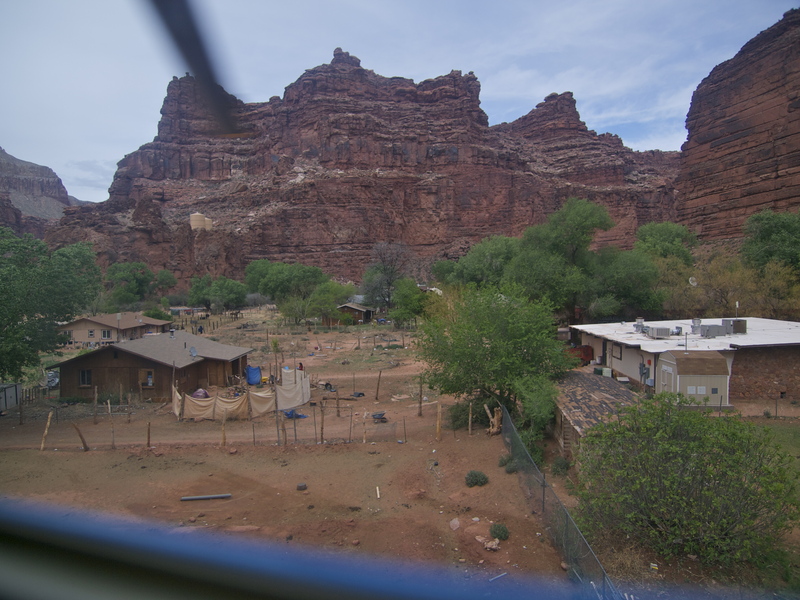 Reading about the Havasupai people brought to mind the book Neither Wolf Nor Dog, which I reviewed in my post of April 5th., about a people struggling still to adapt. I recommend that one. And great post! Good story. I hiked into and camped for 6 days down there about 35 years ago !!! It was a wonderful, beautiful place then. Have always wanted to go back but I am sure it wont feel the same . I did however get to see the Havasu as it flows into the colorado a couple years ago on a Colorado river trip. Beautiful, isnt it?? To bad there have been so many problems. Thanks Susan! I’m sure Supai looks a bit different than it did 35 years ago, but Havasu Canyon itself is pretty timeless. I think you should start planning a return trip! A wonderful story, I really enjoyed reading this. My experiences in Supai align much more closely with yours than many of the stories that have appeared in the media recently so this was refreshing to read. Wonderful pictures as well. Well written and informative. 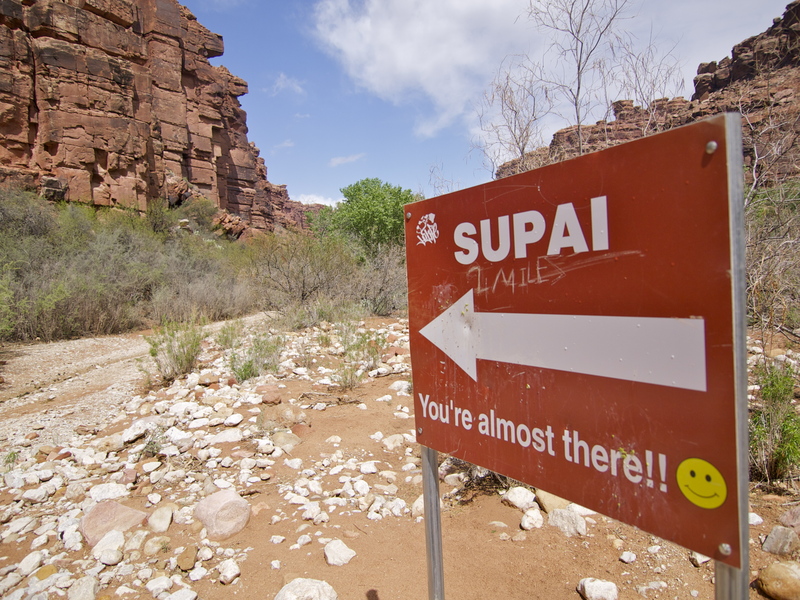 I live in Arizona and have hiked/backpacked into Supai….and out 30 times since 1984. The people must get to know you to be overtly friendly,, but they have a kind sense of humor and will help anyone. Steve Hirst’s Book, ‘I am Grand Canyon’ covers many of these issues. MAybe I’ll see you on the trail! Hi Mary I know this is from 2013 and I may be a little late since I only found you now but I was wondering if you can answer a few of my questions about the village Supai you were in? I’m interested in visiting and possibly moving there but I don’t know much about it and I’ve been doing research but I’d rather hear information from someone who was actually there at some stage. You cannot move there unless you are a teacher, marry a local, or some such. You cannot just move to a rez town like you might move to Denver. Thank you so much for putting this site together, especially the information re: the hike out to the Colorado. I am planning a trip for 2017, if I can get a reservation!